fitness, and STEM (science, technology, engineering, and mathematics), bridging education and fitness, making movement fun! Kids love to participate and move around in these classes and without realizing it, they are learning too! Elfiefit started teaching adults because they love to play kids’ fitness games, as well. Giving adults a chance to play kids’ games allows them to channel their inner child and be silly. Elfiefit’s goal is to get people laughing and moving, making exercise and learning fun! Stefanie Fujinami, founder of Elfiefit, graduated from Loyola Marymount University with a Bachelor’s Degree in Business Administration, emphasizing in Marketing. She also graduated from Pepperdine University with a Master’s Degree in Business Administration, concentrating in Entrepreneurship, a certificate in SEER (Socially, Environmentally, and Ethically Responsible) Strategy, and achieved Beta Gamma Sigma Honors. In the fitness realm, Stefanie is TRX Qualified and certified in Schwinn Indoor Cycling, Strong by Zumba and AFAA Personal Training. She has classroom teaching experience and assisted in starting two charter schools. 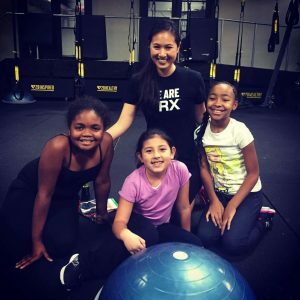 Stefanie brings her passion for getting people active and healthy as a member of both the Westchester Rotary Club and the Beverly Hills Chamber of Commerce. Elfiefit has had the opportunity to teach kids at Ivivva in El Segundo, Kinetic Studio in View Park, and We Rock The Spectrum in Santa Monica. Partnering with Ivivva, a retail sister store of Lululemon, allowed for great exposure on fun ways to stay active with friends on a Friday evening. 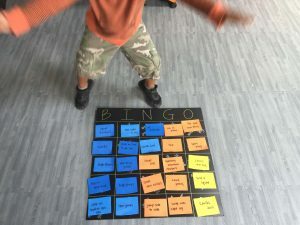 There was fitness bingo, an active mad libs game, and a multiplication exercise game. Kinetic Studio invited Elfiefit to run a kids’ program, educating kids on fitness and the importance of moving their bodies throughout the day. The kids created obstacle courses, hopscotch patterns, and animal movements at different tempos. We Rock The Spectrum is a kids’ gym that welcomes and tailors equipment for all children, including those with special needs. Elfiefit taught a weekly adult class at Del Rey Lagoon in Playa Del Rey. On National Donut Day, the workout simulated the process of making donuts. This included racing around all of the “ingredients” (cones, jump ropes, hexagon shapes, etc. ), ran laps around the basketball court to stir all of the ingredients, and then jumped into designated spots to punch out the donut holes. At the end of the workout, everyone received a piece of a donut. Elfiefit strives to make fitness and learning fun, and although donuts are not the healthiest food around, it’s about balance and special occasion. Elfiefit also partnered with the Southern California Reproductive Center after meeting their Human Resources Director at a Beverly Hills Chamber of Commerce Networking Breakfast. Elfiefit saw the opportunity to enhance their corporate wellness program through this partnership. The program was held at a park across from the Waldorf Astoria Beverly Hills during lunchtime. 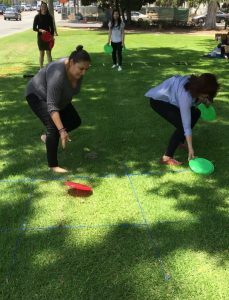 The employees participated in activities such as tic-tac-toe, racing plastic eggs across the lawn, and spelling words with their feet in the air, laughing and giggling the whole time. The HR Director had prizes for each employee who completed the full circuit of games. Her goal was to get the employees outside of the office and provide a fun activity that would release stress and help them build relationships. Elfiefit is the recipient of the Best of Beverly Hills Golden Palm Innovation Award. Celebrate this tremendous honor on October 15, 2018 at Montage Beverly Hills from 6 – 9 PM. For details on the event click here.